Tile flooring remains one of the most popular flooring options because of its timeless elegant look, ease of maintenance, and wide variety of color and style options. 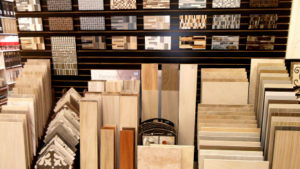 We offer a large selection of tile floors from major brands at the lowest prices; save on name brands including Daltile, Emser, American Olean, Marazzi, Bedrosians, Elegenza, LDI, Interceramica, Stonetech and more. Our professional in-house installers will complete any floor tile, shower and wall tile, mosaic tile and more in a timely and efficient manner. Porcelain Tile is both beautiful and durable; it is very resistant against scratches, stains and moisture and comes in both glazed and non-glazed options. Ceramic Tile allows you a gorgeous and broad design base to match any decor and is easy to keep and maintain. Stone and other natural tile products such as marble, travertine, limestone, quarry tile, granite, quartz and more offer a beautiful, elegant appearance for any room and come in both polished and non-polished. From our Concord / Walnut Creek and Danville / San Ramon showrooms we offer beautiful, affordable tile for every commercial or residential project including bathrooms, kitchens, dens, hallways, entryways and more. If you are looking for a great new tile floor don’t miss our monthly sales and discounted in-stock promotions on tile, tile cleaners and sealers, carpet, hardwood floors, vinyl, laminate and more!